I needed to come to a Trappist monastery to realize just what a gift of silence I already have…right at home. In the room next to mine in the retreat house, there is an older couple. The walls are thin, and in the evening they’re talking and reading to one another. I was somewhat jealous…but at the same time…a bit irked. It seems we have this urge to hear ourselves talk…to somehow constantly reinforce our realities…our identity. Hmmm…something for me to work on this weekend. It was very warm today. What a difference being a hundred or so miles further south makes. 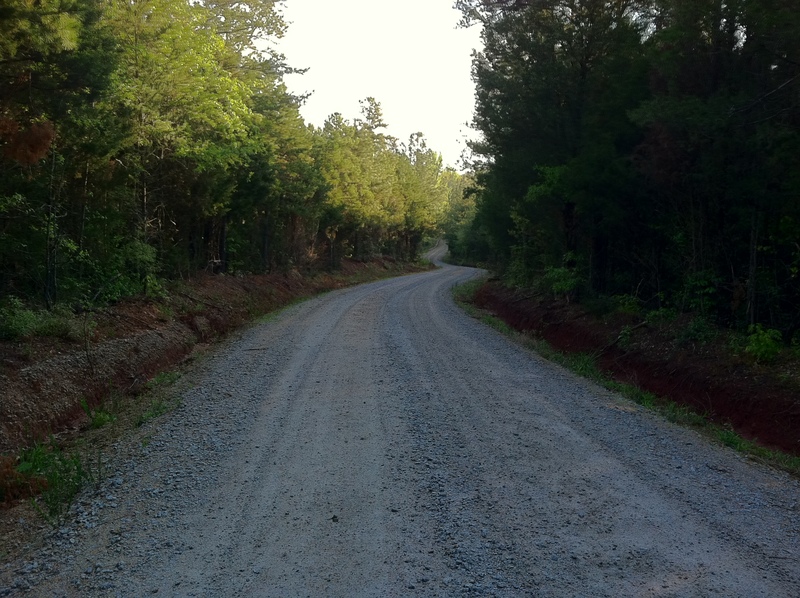 But, there are some familiar sounds…a Carolina Wren…the incessant chatter of cicadas. A pleasant scent of leaves burning somewhere. I find myself reading John O’Donohue’s Anam Cara (Gaelic for ‘Soul Friend’). He appreciates the mystery of life…something I’ve struggled with all my life, having somewhat of an analytical way of looking at things. But I’m learning…to appreciate the unknown…coming to term with the mysterious. It’s probably futile to try to understand too much. There’s always that admonition from Proverbs 3:5-6 that keeps reminding me…“Lean not on your own understanding.” OK…just give up already, and sink into the mystery that is life. During the very early morning hours of Saturday, I was awakened by a very unusual sound in the darkness. It was an owl, very nearby, calling with a voice I’d not heard before. Six ascending, very articulated notes…and then a descending hoot trailing off into silence. It sounded rather spooky as I lay quietly in bed and listened. In the morning, I checked my Audubon Guide to Birds (there’s an app for that)…and discovered that it was my old friend the Barred Owl. 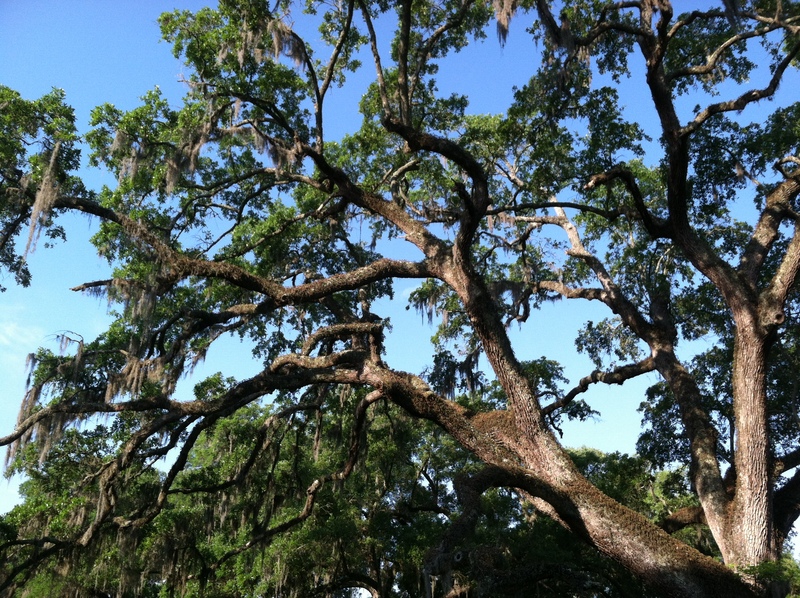 I’ve never heard that particular call back home…but it was a serendipitous highlight of my trip to Mepkin Abbey. 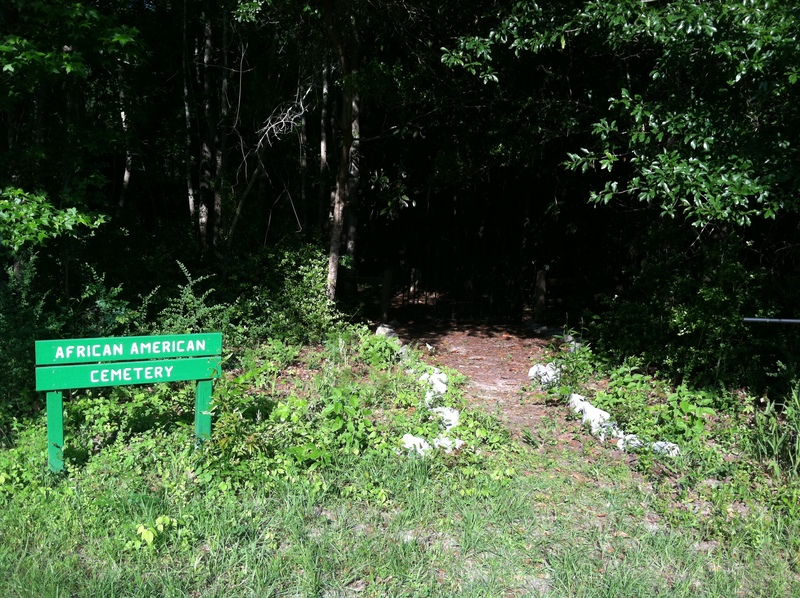 When I first arrived at Mepkin, I noticed a small sign on the way to the visitor center…African-American Cemetery .8 miles, and a path leading into the woods. On Saturday morning, I decided to go take a look…my spontaneous adventure for the day. 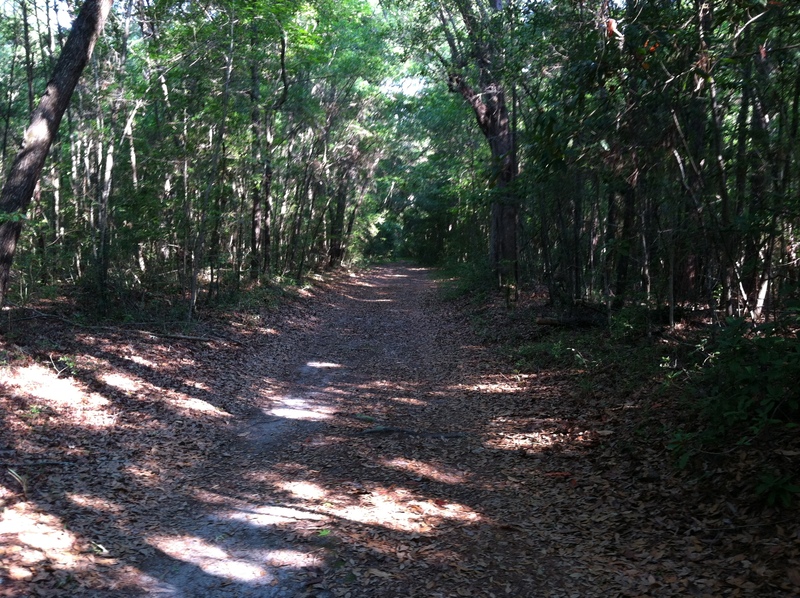 The trail started out dark and dim…under a canopy of trees covered with Spanish moss. After I walked about two-tenths of a mile, the path broke out into brilliant sunshine, opening to a very large farm field that had recently been tilled. Another sign pointed the way across the field, on a narrow strip of grass that bifurcated the field. On the far side, the trail again hugged the perimeter of the field. Another sign…this time pointing again into the woods, with another field beyond. Finally, I arrived at the cemetery…a dark, dismal, forlorn-looking place…guarded by an old, black, wrought-iron gate. I lifted the rusty latch, opened the gate and walked in. There were only four well-worn headstones that I could see amidst the overgrown grass and weeds, in the shadows of the dense trees overhead. I later learned that this was the old Clermont cemetery…the final resting place of slaves that had lived on the old Mepkin plantation. The cemetery was discovered about fifty years ago by some monks from Mepkin Abbey, when they were clearing land in the vicinity. While fending off mosquitoes…I paid my respects to those who rested here. I could make out the names on two of the gravestones…Rosa Lee…and Ethel. A string of colored beads was wrapped around one gravestone. 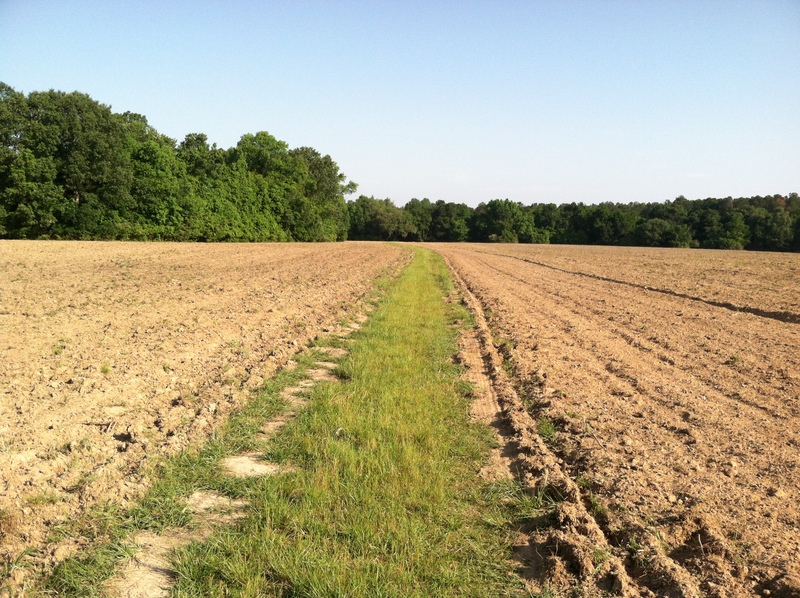 Hallowed ground…in the middle of a dark and almost forgotten patch of woods in the low country of South Carolina. I said a prayer for these women, who had lived in very troubled times, but who now, as noted on their headstones…were asleep in Jesus. Walking back to the Abbey…hugging the edge of the fields on wet, overgrown grass…hearing a lonely train whistle in the distance. It seems that our lives are but a jumping off point to a world of which we know nothing. We cling to this life, trying to make it home, when in actuality we’re but standing on the shores of an immense, unseen ocean…not even capable of imagining the distant lands on the other shores beyond. On a path…through the dark wood, that leads out into the blaze of sunlight…crowned by a glorious dome of blue. A quiet, cool day here in the Waxhaws. The weather, unsettled…a gentle rain off and on again…the sky gray and moody. A good day for reading. I finished The True Icon , by Paul Badde, his ruminations on the Shroud of Turin, as well as the lesser known Veil of Manoppello, both believed by some to portray the true likeness of Jesus Christ. He doesn’t attempt to prove or disprove the authenticity of these images, which many say “…are not made by the hand of man”. Instead, he asks the simple question…what does it mean if, in fact, these are the real thing…how would they have affected Christianity from its very beginnings until the present? And that led me to begin Rag and Bone: A Journey Among the World’s Holy Dead , by Peter Manseau…a look into the strange history of relics and the intersection of faith and physical objects…such as toes, tongues, bones, and other assorted body parts. I know…it sounds like strange reading (Someone…please save me from my Kindle with its one-click buying). So…I was in another world for most of the day. Taken back to the empty tomb on that fateful morning so long ago…empty except for the two strange cloths that were left behind, and that when seen by Peter and John, caused them to believe (John 20:1-10). 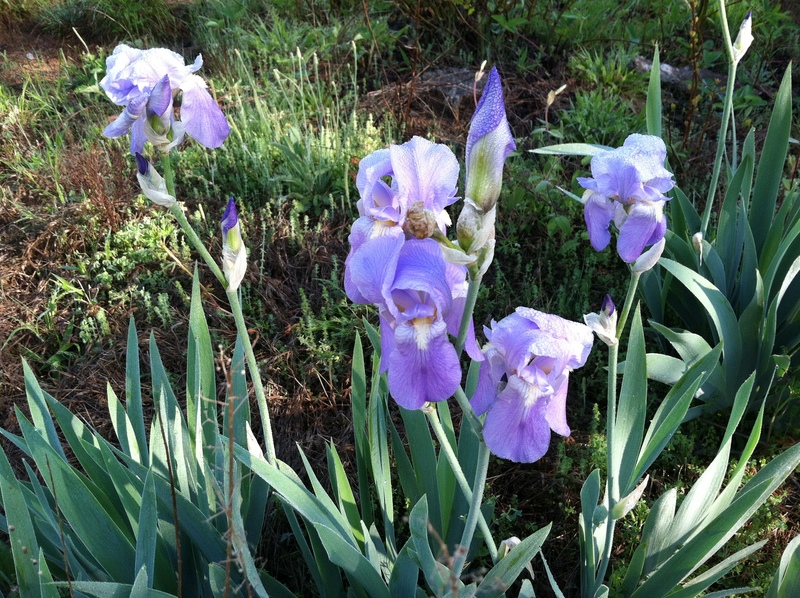 And then…set on a quite different path…thinking about how saints, mystics, and sages have continued to provide solace and consolation to believers long after they have departed this earth. When I later ventured outside with the dogs…the cool misty air enveloped me. The grass…which hasn’t yet been cut this season…is somehow looking very beautiful. A wild turkey is flushed from the tall grass by the dogs’ barking…rises…flapping its wings and escaping into the woods. There’s a sweet scent of something on the wind…clover…or maybe honeysuckle (which was Sharon’s favorite…her birthday is this coming Wednesday). It’s now late in the afternoon, as I sit writing this post. The sun is breaking through the clouds, which are now a heavy dark gray against a deep indigo blue sky. There are diamond-like water droplets on every leaf and blade of grass, each reflecting, like tiny prisms, the brilliant rays of the sun…hidden for most of the day. A Carolina wren is happily singing outside… while inside I’m listening to the Lux Aeterna by Morten Lauridsen. Is this not one of the greatest music videos ever? Ahh…the joys of growing old…and going to the end of the line. Very early this morning, I awoke from a dream in which I thought I heard the strange calls of Sandhill Cranes outside. Still in the dream, I looked out the window and saw a flock of cranes grazing on the grass out front in the darkness. Later, after awakening…in the early light, when I took the dogs out…passing overhead was a ‘vee’ of Canada geese, heading North. Perhaps…I thought…I did hear some Sandhill Cranes during the night? They have been known to migrate at night. It is Spring, after all..migration season. I may have heard…in my sleep…the peculiar and primitive rattlings of cranes as they swept across the dark, still, early morning sky. But this morning…no auks or flamingos…but I’ll surely settle for the beautiful sight of geese making their journey to the Northland, buoyed by a gentle wind from the South. I’m becoming a regular at the animal hospital in town. Seems like every Saturday, after I take the trash to the recycling center…it’s then off to the vet with one of the dogs. This week it was Tinker. She had to have her blood checked again to see if she was getting the proper dosage of Soloxine for her hypothyroidism. She’s also been scratching a lot lately, so I thought I would have the Doc look her over. Saturdays are walk-ins only…and when I opened the door to the clinic, it was packed with dogs and cats waiting their turn. There were three Pugs sitting next to Tinker and me. They had their eyes glued on us, and I half-expected one to break the ice and say, “Well what are you staring at?” Ever since I saw the movie Men in Black, Pugs give me the willies. Everyone seemed to be amused by the way Tinker emits a growl whenever a BIG dog enters the room. For her diminutive size…she’s fearless. A big dog in a little dog’s body. And she’s not afraid to show her displeasure when other dogs get a little too familiar. Two hours later…Tink and I were ushered into an examination room, where a young woman whisked her off to draw some blood. About twenty minutes later, the Doc came in and looked Tink over. 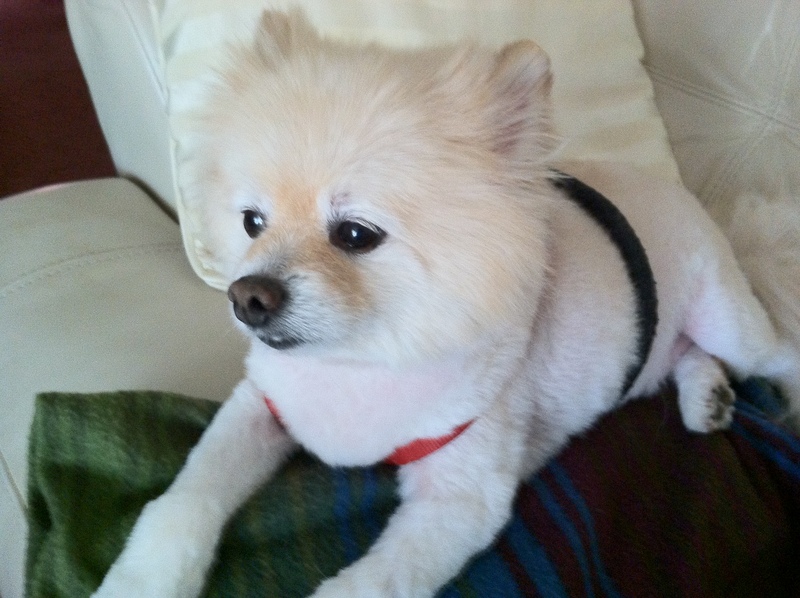 “Probably springtime allergies”, he said…her skin being a bit reddish and inflamed, leading to the scratching. Short of going through the whole process of testing for specific allergies, we determined the best plan of action would be to give her that modern-day wonder drug…Benedryl (curiously, the Over-the-Counter drug Diphenhydramine is somewhat of a cure-all that helps relieve allergies, acts as a sleep aid…I take it myself sometimes…and can also be used by desperate parents to calm rambunctious toddlers. I find this strangely comforting…). P.S. Last Sunday was Tinker’s birthday…eleven years old. There’s another road appearing…out of the mist…completely unexpected. Another stage in the grieving process? It will surely be my time soon…but not quite yet. This morning, there was ice on the windshield of the car. But…this evening…sitting on the porch…absolutely still…complete silence…complete bliss. I look for any movement in the trees…not a single leaf moving. Birds…a flash of gold in looping flight…a goldfinch. Bluebirds literally falling out of the cedars into the grass below. Mourning doves sweetly calling off in the distance. 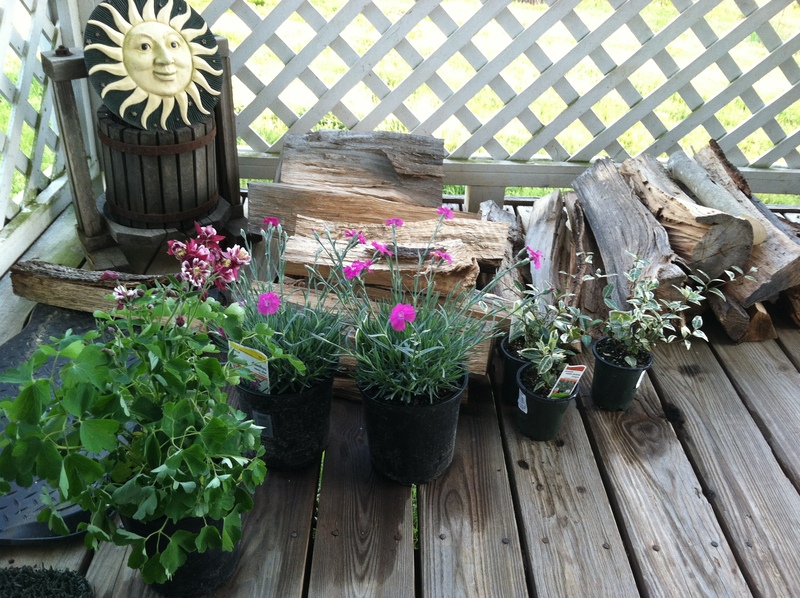 Potted columbine, dianthus, and jasmine against a pile of unused winter firewood…a geranium with pink blossoms…a Japanese maple…patiently waiting to be planted in this gentle season. Across the road, in the pasture…Randy’s goats standing on hind legs against the fence…reaching for fresh leaves…with the golden sunlight slanting on the grass. A dreamlike…chilly evening. An airplane arcing silently through the blue sky above…golden in the setting sun…and then disappearing without a trace. Grace unfathomable. Tears in my eyes…grateful.